Engineers have developed a light detector that combines two disparate technologies to distinguish different wavelengths (colors) of light, including both visible and infrared wavelengths, at high resolution. The new device incorporates both nanophotonics, which manipulates light at the nanoscale, and thermoelectrics, which translates temperature differences directly into electron voltage. The new detector operates about 10 to 100 times faster than current comparable thermoelectric devices and is capable of detecting light across a wider range of the electromagnetic spectrum than traditional light detectors. 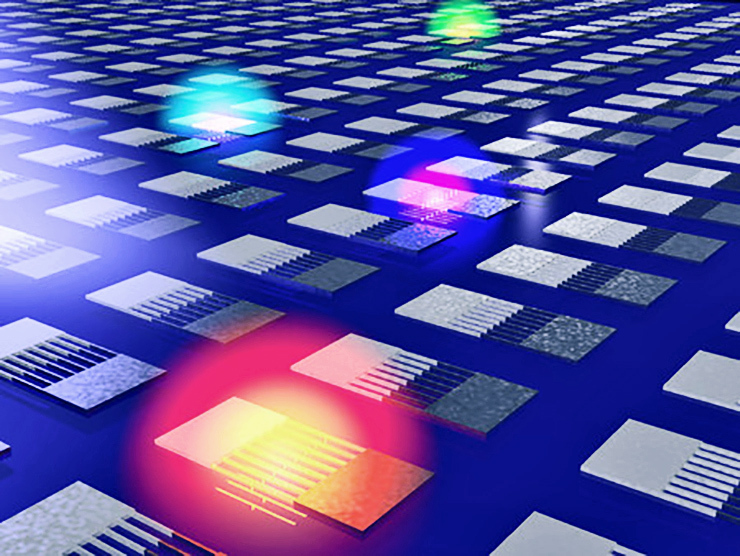 In traditional light detectors, incoming photons of light are absorbed in a semiconductor and excite electrons that are captured by the detector. The movement of these light-excited electrons produces an electric current—a signal—that can be measured and quantified. While effective, this type of system makes it difficult to “see” infrared light, which is made up of lower-energy photons than those in visible light. “In nanophotonics, we study the way light interacts with structures that are much smaller than the optical wavelength itself, which results in extreme confinement of light. In this work, we have combined this attribute with the power conversion characteristics of thermoelectrics to enable a new type of optoelectronic device,” says Harry Atwater, corresponding author of the study, a professor of applied physics and materials science at the California Institute of Technology, and the director of the Joint Center for Artificial Photosynthesis (JCAP). Atwater’s team built materials with nanostructures that are hundreds of nanometers wide—smaller even than the wavelengths of light that represent the visible spectrum, which ranges from about 400 to 700 nanometers. The detectors were fabricated in a cleanroom, where the team created subwavelength structures using a combination of vapor deposition (which condenses atom-thin layers of material on a surface from an element-rich mist) and electron beam lithography (which then cuts nanoscale patterns in that material using a focused beam of electrons). The structures, which resonate and generate a signal when they absorb photons with specific wavelengths, were created from alloys with well-known thermoelectric properties, but the research is applicable to a wide range of materials, the authors say. The findings are described in a paper appearing in the journal Nature Nanotechnology. A Department of Energy Office of Science grant funded this research.